The Tamil National alliance (TNA), which is the official Opposition in the Sri Lankan parliament and the ruling party in the Northern Provincial Council, will continue to support the ongoing process to draft a new constitution for Sri Lanka despite internal dissensions. 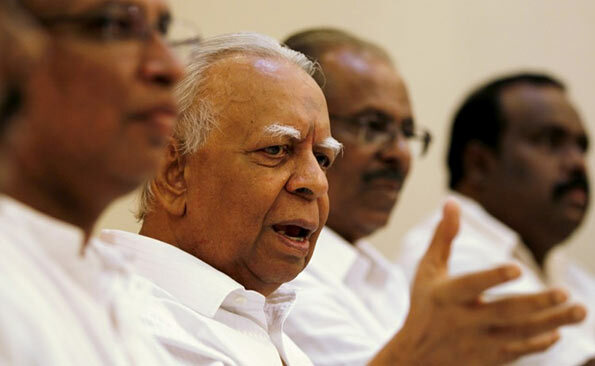 The TNA, which met twice last week, decided to accept leader R.Sampanthan’s advice that despite doubts about a getting a favorable outcome from the constitution-making process, the process should be supported because there is no alternative to it. The TNA leader thinks that the present Sirisena-Wickremesinghe dispensation is the only one which can deliver goods for the Tamils because the Sinhala opposition parties led by a resurgent and former president, Mahinda Rajapaksa, are resolutely and uncompromisingly averse to any more devolution of power than what was given under the 13th Constitutional Amendment enacted in 1987. The Jamatha Vimukthi Peramuna (JVP) is fighting for equal rights but is wary about federalism and the expansion of ethnic enclaves. The Jathika Hela Urumaya (JHU), a strong voice within the government, is against any more devolution. However, Sampanthan’s plea for cooperation rested on the hope that the personal and explicit commitment of President Maithripala Sirisena and Prime Minister Ranil Wickremesighe to promoting ethnic reconciliation through appropriate constitutional provisions would stay through the process and influence the final outcome. The TNA leadership believes that unlike the Rajapaksa regime, the current regime is pledged to implementing the September 2015 resolution of the UN Human Rights Council (UNHRC) which includes devolution of power. Given the part played by the international community in the political marginalisation of the Mahinda Rajapaksa regime and its defeat in January 2015, the TNA leadership believes that the present government will not totally disregard its commitments to the UNHRC. The TNA’s leadership urges the Tamils not to attach primary importance to nomenclature such as “federalism” or “unitary”, but to go for the substance of devolution irrespective of the term used. It also wants the Tamils to realise that the Muslims, though Tamil-speaking, do not want the East to merge with the North because that will make them a smaller minority in the East than they are now. The TNA leadership had a tough time convincing its members to accept its line. Day after day, leaders across the Sinhala political spectrum are coming out with statements opposing the Tamil minority’s basic demands such as a federal constitution, enhanced devolution of power beyond the 13th Amendment, and the unification of the Northern and Eastern Provinces to form a single Tamil-speaking province. Prime Minister Wickremesinghe’s United National party (UNP) has not publicly committed itself one way or the other and its public pronouncements are restricted to reiterating the 2015 election manifesto which promised a new constitution to solve the ethnic question. As for President Sirisena, while he himself has been making the right noises, officials of his party, Sri Lanka Freedom Party (SLFP) and its alliance, the United Peoples’ Freedom Alliance (UPFA), have categorically stated that their organisations will not countenance anything more than better implementation of the existing 13th Amendment. They have rejected the TNA’s plea for the merger of the North and East to form a single Tamil-speaking province. Explaining the TNA dissidents’ stand, former MP and leader of the Eelam Peoples’ Revolutionary Liberation Front (EPRLF), Suresh Premachandran, said that the TNA has the moral right to seek reciprocity from the government and the Sinhalas. “The present government is in power because of the en masse electoral support of the Tamils. And when the Tamils have given up the goal of independence, have come down to demanding federalism and are even ready to eschew the use of the term federalism to respect the sensitivity of the Sinhalas, why do the Sinhalas insist that the constitution must explicitly say that it is a unitary one? Could we not meet halfway?” he asked. Premachandran said that the TNA should use the India connection to pressurise the Sri Lankan government because the India-Sri Lanka Accord of 1987 enjoins India to settle the Tamil question and underwrite it. “When the North and East were demerged in 2006 violating the India-Sri Lanka Accord in spirit, no less than Dr.Manmohan Singh, the then Indian Prime Minister, told the TNA that all options were open to India. The TNA should capitalize on this and take a delegation to New Delhi to talk to the Indian leaders,” Premachandran said.